Am thinking today about hatmaker Mr. John, and how peculiar it is that this stellar designer from America's midcentury has fallen into near total obscurity. 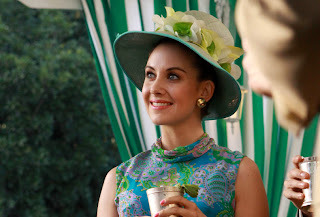 Perhaps if we all continued to wear hats as beautifully as Mad Men's Trudie Campbell does here his name would remain emblematic of all that was chic in the American style. Himself a German with a background in medicine and art, John Pico Harberger came to the States in 1919 and set up shops in New York, Miami, and Palm Beach. Over his long, long career his most noteworthy achievements were designing the millinery for Scarlet O'Hara in Gone with the Wind, Marilyn Monroe in Some Like it Hot, and winning countless awards, including fashion's highest honor, the Coty American Fashion Critics Award. His clients included Greta Garbo, Jackie Kennedy Onassis, and the Duchess of Windsor. "A hat cannot actually give one golden curls if the hair is mouse-colored and stringy; it cannot lift a face, pay overdue bills, subtract ten years from one's age, or transform a plain soul into a reigning princess. But it can lend practically any woman a temporary out-of-herself feeling. For the right hat creates a desired mood, and that isn't fiction or fancy, but fact, fact, fact." I suspect the man would be less than pleased to see his creations for sale on eBay, but so they are, and well undervalued they are too. Case in point: this ravishing feather toque, complete with a box that itself is so wonderfully evocative of its age and station. I'd say a Mr. John revival is well overdue. Love Mr. John hats. He and Frank Olive are two of my favorites. Such an informative post! I had no idea that's who did the hats for GWTW! I'm ready for a Mr. John revival. My favorites are the ones from the late 60s, early 70s, when the fashion world was high on nostalgia and John was turning out the most perfect 1930s inspired hats. Really flattering they were! Hats...I so wish that Vogue and other trend setting magazines would start featuring hats again.